I thought this was a great feature for those of us who are keeping ourselves busy and don’t want to spend a ton of time hunting down all of the accessories for Halloween costumes. I mean, it’s October already?! Yes, it’s MID-October now and I haven’t put together our costumes yet. 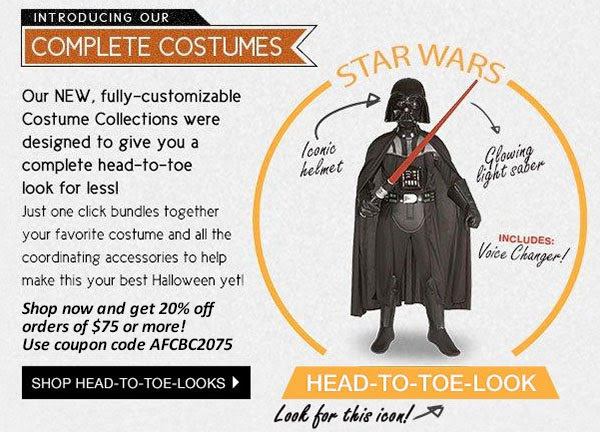 This option to buy a complete costume with accessories saves a ton of time, plus there’s a coupon code for 20% off! BuyCostumes has kid and adult costumes so you can order everything you need from one place.